Flying Star Feng Shui is the most dynamic and accurate technique and is comparable to astrology for buildings. It is one half of the techniques of Feng Shui one needs to master. The Universe is ever changing and natural influences evolve with the passage of time. Flying Star Feng Shui incorporates the elements of time and space. It will enable you to trace the pattern of change through the 20 year periods called "ages". It makes it possible to access the fortune of a dwelling. With practice, one can learn how to unblock energies that affect the aspects of prosperity and health in a dwelling. 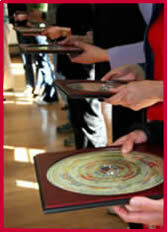 The Luopan Compass is the essential tool in Classical Feng Shui. Its many rings reveal vital information in assessing a dwelling or building site and contain a large body of knowledge that encompasses classical Chinese philosophy, numerology and cosmology. The Chinese Luopan can take a very long time to master since it requires prior learning of the Chinese characters. The specially designed Luopan with English translations based on the classical model simplifies the process and makes it easier for the western student to learn and use.